I love reading these madlibs. The only problem? We don’t get to hear from Craig himself. So I decided to come up with a set of questions and asked Craig to answer them. Here’s the Q&A. Q: Aside from folks like Marketo and HubSpot, what B2B marketer is doing lead gen really well? A: Tough question. Kissmetrics is a model for online marketing but I’ll give you a surprise one: Sales Benchmark Index. They are a services company and these types of companies typically struggle with demand generation — they have built a content marketing, lead generation machine. They post every day, create an ebook/month and do a webinar. Their content is specific and comprehensive. They offer templates for download. They are an impressive use-case for content marketing. Q: For lead gen, what’s one social network no one is talking about? A: YOUTUBE. It’s the second most popular search engine and no one in b2b has it figured out. There are about to be some amazing stories of b2b success on youtube. Q: If you could select just one metric, what should B2B demand gen folks be measured by? A: Influence on pipeline. In b2b, 9-25 touches take place before a buyer buys. Why aren’t we tracking every touch and attributing that to marketing success? Q: Peanut butter is to jelly like marketing automation is to? A: Demand generation success. Strategy, process, people, and then marketing automation/software. You don’t sell without CRM anymore, you shouldn’t digitally market without a platform. (Craig note: I added “/software” to marketing automation in order to include Hubspot who does not like the term marketing automation). Q: Retargeted display ads to drive anonymous web site visitors back to your lead capture pages. Yes, no, maybe so? A: Yes. I recommend retargeting. I don’t just worry about lead capture, I feel like retargeting is highly effective from just a pure branding perspective. I personally don’t click on display but when I get retargeted, I notice and remember the company. It’s like “everywhere I turn, I see you.” I know we are all metrics focused, but there is something to be said about the overall branding aspect to retargeting. You may even consider it another from of nurturing to go with a company’s frequent emails. Q: What’s the number one thing to keep in mind when cold calling? A: That cold calling does not have to be “cold” any more. There is so much information on social networks and the internet about your prospect that you can turn what was formerly known as a cold call into a warm call. Q: Sales development reps are often disconnected from prospects’ activities in social. How can marketers fix that? A: The problem with social and sales isn’t the ability to get information, it’s teaching them to know what to do with it. There are a number of tools: LinkedIN Sales Navigator, Hootsuite, InsideView, for enterprise. Radius Intelligence for SMB that can give a rep social visibility. It doesn’t matter what you provide them if they don’t know what to do with the information. You have to coach reps on how to weave that information into your communications. Event marketers: create video, white papers and webinars from your event content. Q: With regard to the sales funnel, what’s the biggest opportunity that event marketers are NOT doing? A: Here is my view on event marketing: they need to take a step back and try to understand what the buyer journey is today and how live events can fit in. Then they need to look at the vendors and understand how they are selling, and try to tie that back to live events. What is going to add the most value to the buyers and sellers at my event? That may be too general, but I have a long list of things that I’d like event marketers to do besides re-think the overall structure. Content still has to improve to meet the standard set on the overall internet, one-to-many content (they are SO focused on the live event but they should be creating video, whitepapers, webinars, etc. from the event content), more digital interactivity during the event and after. Q: It’s been said that Google tested 40 shades of blue to determine the right color for links. Email marketers talk a lot about A/B testing. What about A/B/C…N testing. Your thoughts on testing numerous flavors? A: Let’s discuss pros and cons. Pro: My belief is that is the consumer internet guys are typically the best at on-site conversion, etc. so copy them. If Google A-N tested to find the best conversion, b2b marketers should learn from that. Today’s agile marketer views the world as “stand it up, then test, test, test.” B2B marketers tend to focus on really big problems which is fine, but to really online market, you want to optimize every conversion point. Con: You need to have a big enough sample to even A/B test. When do you have enough data to make a good decision? Q: I just graduated from college and started a career in B2B marketing. Besides subscribing to the Funnelholic RSS feed, what’s the first thing I should focus on? A: Well you completed step one. When young people ask me about getting into marketing, I tell them: get a job in marketing anywhere, anyhow. The problem with b2b marketing is there isn’t enough education on the discipline. You will not learn it in school. So get a job, then soak it in. Then educate yourself: build your feedly with 15-20 b2b marketing sites — but my favorite starter sites are Neil Patel’s QuickSprout and Kissmetrics blogs. My brother wanted to get up-to-speed on internet marketing: he started reading Neil’s stuff and is now pretty much up-to-speed. The marketing software vendors have GREAT blogs like Marketo, Hubspot, Act-On. Set aside 1 hour to learn every day. The other thing is to find mentors and ask them everything you can. Also, network, network, network — I tell young people, network with peers and ask them everything. I still do that every day. I learn a little here and there from my friends. Q: You’re now providing consulting services for organizations’ sales and marketing teams. Tell us about your services and where can folks contact you for more information? A: I am a consultant again! And I am having the time of my life. I forgot what it is like to work with amazing people on the complex challenges they face in today’s rapidly changing sales and marketing environment. The supply chain of business has repeatable, metrics driven processes that deliver/over-deliver products. We help organizations design, build, and/or optimize their Revenue Chain to predictably deliver/over-deliver revenue. We create actionable, specific playbooks in the following areas: content strategy, social strategy, demand generation, lead management, marketing technology, lead qualification, inside sales, sales technology, and sales process. People can find me on www.funnelholic.com. Got a question about virtual events, virtual trade shows, virtual career fairs, etc.? Post it to FOCUS.com and a network of FOCUS Experts is here to help. Focus “provides millions of professionals with the expertise they need to make better business decisions. At the heart of Focus is a network of world class business and technology experts. These experts power the real time Q&A, world class research, and personalized support that so many businesses now depend on”. Should virtual event teams reside on the IT or Business side? Virtual trade show booths: What are best practices for creating virtual event booths? What are your top three tips for planning a successful virtual event? Virtual Trade Show success: What is the ideal number of exhibitors at an event? What should your content strategy be for your virtual event booth? Virtual Events: Best practices for determining the success of your virtual event? Join the conversation! If you need some help with your virtual event strategy, planning or execution, post it on Focus. If you have thoughts and experiences to share, “come on down”. Hope to “see you” there. Step #2 (“Engage & Qualify”) is quite unique for virtual events, compared to other online lead generation activities. Virtual events allow you to generate leads (Step #1) and engage and qualify them on the spot. With a white paper download or an on-demand webinar, the engagement and qualification occurs after the prospect has requested your content. Note that I said “requested” – with a white paper download, you don’t even know if the prospect read the paper. As the diagram above illustrates, effective use of virtual events for lead generation is done in a circle (or cycle), where you begin the next event with learnings from your prior event. By knowing what worked and what didn’t work from your last event, you fine tune and optimize your strategies and tactics and become more effective in generating and engaging leads with each event. So think of virtual event lead generation as an ongoing journey and not a discrete project. To help on your journey, here are some useful resources that I’ve come across. An interview with The Funnelholic, which includes insights on lead generation with virtual events. I’ll soon be publishing a book that provides related advice on generating sales leads with virtual events. For further information on lead generation and virtual events, “Like” the book’s Facebook page. Updates on the book’s availability will be posted here. Best of luck on your own journey! I’m finalizing a book, “Generate Sales Leads With Virtual Events.” I’m self-publishing the book via a neat service called FastPencil. The book will be available for sale in a few weeks – it will be listed on Amazon in both traditional (printed) format and for the Kindle. The book will feature a great foreword written by Craig Rosenberg (@Funnelholic), a lead generation expert. Feel free to edit this page, to show us how you would have written this chapter – thanks! I can vividly recall my first experience exhibiting at a trade show. It was the early 1990’s and I was fresh out of college. I worked for a company that sold Internet connections to corporations. My colleagues and I flew across the country for the conference, where we sought to generate sales leads. We arrived at our destination a day or two prior to the conference, so that we could set up our booth, network our demo workstations and place our sales collateral in neatly organized stands on the show floor. Undoubtedly, a colleague or two got stranded in their home airport, forcing a lucky few of us to pick up the slack and handle the booth set-up. Then, there was the workstation monitor that wasn’t delivered to our booth. Did our colleague forget to include it in the shipment? Was it lost in transit? Or was it on the conference facility’s loading dock? It was late in the evening, so no one was available to answer these questions. Hopefully, we’d be able to sort it out in the morning. The workstation monitor ended up arriving a day late, but everything came together and we had a successful show. I spent my time giving demonstrations to curious booth visitors, who wanted to know more about the “Internet”. This was before the Mosaic and Netscape browsers hit the scene, which meant that Internet demos centered largely around character- based “telnet sessions” to services called Archie, WAIS and Gopher. At the end of the conference, we were tired and weary, but managed to collect some 50 business cards that we’d distribute to our sales team when we returned to the office. For particularly “hot” leads, we scribbled notes on the back of business cards, sending along important notes to the receiving sales representative. Fast-forward to our present day era of widespread broadband, Web 2.0 and social marketing. But now imagine a trade show that has global reach. A trade show that requires no travel, lodging or “out of office” time. A trade show with no physical booth set-up. A trade show with detailed tracking of sales lead activity. A trade show that remains available after the scheduled activities conclude. Welcome to the virtual trade show! Virtual trade shows are a flavor of the broader category of virtual events. In the coming chapters, I’ll cover how virtual events can be effective in generating sales leads. How can marketers satisfy both objectives simultaneously? With the evolution of the web, many have turned to online lead generation. With online lead generation, marketers can distribute content across the web – white papers, product collateral, case studies, webinars, videos, podcasts and more. Prospects “discover” the content via the company’s web site, search engines, publisher web sites or via social networks. Before a prospect can gain access to the content, they may be required to complete a registration profile. When the prospect completes the profile, we call this a “generated lead” and the marketer has just gained a “sales inquiry.” Web-based, online lead generation comes with fairly low costs, since the “transactions” occur entirely on the web – the costs for shipping, print, freight, travel, etc. are from days long gone. Once a lead is generated, marketers must qualify the lead. Often, Marketing will perform an initial evaluation of a lead via pre-defined criteria, such as country, job level, company type, size of budget, etc. The marketer will need to gauge the prospect’s interest, along with their position in the sales cycle. Is the prospect engaged in preliminary research to define the solution space? Or, has the prospect defined the solution space and is looking to narrow the list of potential products? Or, perhaps the prospect is at the tail end of the evaluation and is looking to make a final decision on a product. To determine the prospect’s position in the sales cycle, marketers often use a series of communications (e.g. emails, phone calls, etc. ), evaluate the responses (if any) to those communications and then follow up with subsequent communications. Marketers decipher the clues provided by the prospect and determine whether to forward the prospect to Sales – or, to continue the qualification process. Did the prospect answer my phone calls? Did the prospect answer the questions we asked? Did the prospect open my emails? Did the prospect click on any of the links in the emails? Did the prospect download any of the documents referenced in the emails? Has the prospect requested more information – or, a meeting with us? Marketers can develop formulas around the prospect’s interactions, to determine which combination of actions moves the prospect from a sales inquiry to a Marketing Qualified Lead (MQL). Once prospects have moved into MQL status, they can be distributed to the Sales team for further follow-up. A primary challenge in this process is the amount of qualification that occurs “post-lead.” At the time the lead is generated, a minimal amount of information is known about the prospect, beyond the information submitted in the registration profile. With a webinar, a marketer may know how many times it was viewed – or, the total viewing time across all views. With a white paper or podcast download, however, the marketer only knows that a request for download was made. The marketer may not even know whether the download completed – or, if the content was consumed! As a result, marketing qualification depends upon ongoing touchpoints with prospects, with the hope that they continue to respond to marketers’ communications. Now, let’s consider virtual events. I define a virtual event as “a web and occasion-based gathering that facilitates information sharing, collaboration and interaction.” Alternatively, consider a trade show, with its sessions, presentations, exhibitor booths, networking areas, etc. – and have it occur 100% on the web. We call that a virtual trade show. Virtual events can be a dream for marketers. They can generate leads cost effectively and they facilitate real-time interactions with sales prospects that can lead to quicker and more efficient marketing qualification. 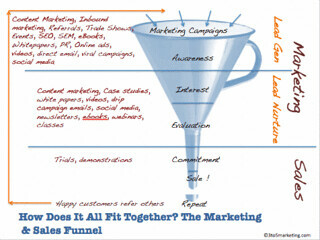 The “post-lead” nurturing process has been combined into the same act of generating the lead. I call this “accelerated lead generation” and for marketers, this means more “sales ready” leads that Sales can then turn into faster bookings. This book will show you how to create those valuable, real-time interactions – taking you from the planning process, to audience generation and engagement strategies and finally to lead qualification and follow-up.